Last week we completed another PADI Open Water Diver Course in Dutch, this time with Con, and we certified Adam as a PADI Digital Underwater Photography Diver (and also as an Master Scuba Diver :). It’s always amazing to discover together all the small creatures under water and see things you have never seen before. 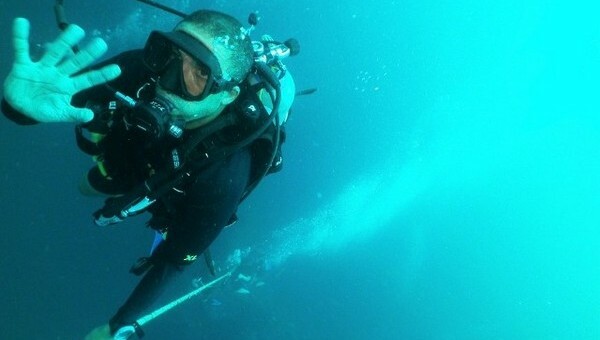 Diving with a photo-camera in your hands gives another dimension to your dive. You move slower and with more attention to everything that there is to see. Adam shoot (among others) some nice pictures of a beautiful seastar, a moray eel, a lobstar and of the Roman Columns. The Roman Columns are at a depth of 24 meters just below the Cape of Taormina and is an interesting divesite. The story goes that these columns fell of a boat into the water when they where (re)building the Greek-Roman theatre or another temple in Taormina long time ago. Nowadays, we can still visit the Romans Columns and have a nice dive around them. We also had the pleasure to take 55 french snorkelers from the École internationale bilingue Paris to the Isola Bella Marine Park. During navigation we told them the stories and the legends of the area and explained them the ecology and marine biodiversity of the Mediterranean Sea. After a boatride to the Blue Cave, the Isola Bella and a snorkeling briefing, they jumped in the water to discover the different elements of the marine environment. It was a nice and educational morning. The next event we will organize is a Project Aware – Dive against debris on 28th of April. This dive will take place next to the Isola Bella and is organized in cooperation with the Lega Navale Italiana (Giardini-Naxos/Taormina) and different schools from the area. All together, we will clean the beach and also underwater. It will be a great opportunity to make young people aware of the environment and their influences on it. Join us!